Aug. 12, 2015 + + + Today marks the official start of construction of the modular large-scale battery storage system M5BAT on the premises of RWTH Aachen University. Storage systems like this represent an important building block for the expansion of renewable energies, as they make a significant contribution to system stability. They also open up a broad range of areas of application. The planned power class of five megawatts and the high level of modularity – whereby different battery technologies are combined with one another – make the so-called “M5BAT” (Modular Multimegawatt, Multitechnology Medium-Voltage Battery Storage System) a world-first. M5BAT is backed by a € 6.7 million grant from the German Federal Ministry for Economic Affairs and Energy as part of its “Energy Storage Funding Initiative”. The project’s partners include the E.ON Energy Research Center and the Institute of Power Systems and Power Economics at RWTH Aachen University (IAEW), the energy company E.ON, the battery manufacturer Exide Technologies GmbH with its business unit GNB® Industrial Power, and the inverter manufacturer SMA Solar Technology AG. “As part of its innovation activities, E.ON is investing in a broad spectrum of future technologies for energy storage. Large battery storage systems are particularly interesting thanks to their flexible possibilities for use. The findings expected from M5BAT are of value for the entire energy industry, particularly as a means of support on the path towards low-CO2 power generation,” explains Bernhard Reutersberg, Chief Markets Officer on the E.ON Board of Management and thus responsible for Technology & Innovation, amongst other things. The storage system will be located in a former office building that is being converted specially for the installation. In total, the batteries and all other components of the power storage system will stretch over two floors and the roof, covering total floor space of approx. 500 m². The building conversion is being carried out by E.ON, whilst the E.ON Energy Research Center will take charge of coordinating the assembly of the batteries. The manufacturers Exide Technologies and SMA Solar Technology AG are supplying the technical components. The battery storage system is due to be completed in mid-2016. 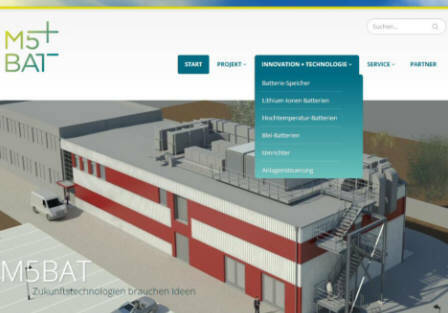 The website www.m5bat.de provides comprehensive information about the project and the technologies used, as well as a construction timeline with image and text material. This allows users to follow the construction of the storage system step by step.